It should be no surprise that the gaming business will reach $107 billion in revenue by 2017. With games like Warcraft and Grand Theft Army, more and more people are spending cash on the next hottest games. But there is one game that helped the industry create such a profitable turn, Guitar Hero. Creators and brothers Charles and Kai Huang created Guitar Hero, which made quite a disruption. The popular game that allowed anyone to live out their dreams of being a rockstar eventually led the brothers to make a billion dollars in sales. MillionaireMatch got the scoop on how the Huangs disrupted an industry at a time no one knew who their names. Charles and Kai created RedOctane in 1999, when startups were blossoming everywhere. “Everybody was in a startup. It was just the thing to do,” Huang said. Huang who was born in Taiwan moved to the states as a child. He worked in a grocery store owned by his father in New York. After five years of the concrete city, his family moved to Mountain View, California, where he was introduced to the world of gaming and technology. After graduating from the University of California at Berkeley, Huang went back to working with his dad. This time the business was importing auto parts, which gave him experience with manufacturing and hardware. During the early times of RedOctane, not only was everyone working at a startup but finding money was no problem. “It was a unique time, window that you could start an internet business in almost any field and almost any background. I would say with just a PowerPoint you would get a million dollars in funding. If the PowerPoint was any good you would get two million dollars,” Huang said jokingly. But at the time Guitar Hero would be launched investors began to shy away from investments, making it impossible for Huang to secure funding. Not having venture backing forced Huang to operate differently and to make different decisions. He couldn’t afford to have Guitar Hero on the shelves due to a 60-day turnaround of seeing any of the revenue. Instead, he opted to sell the product online. 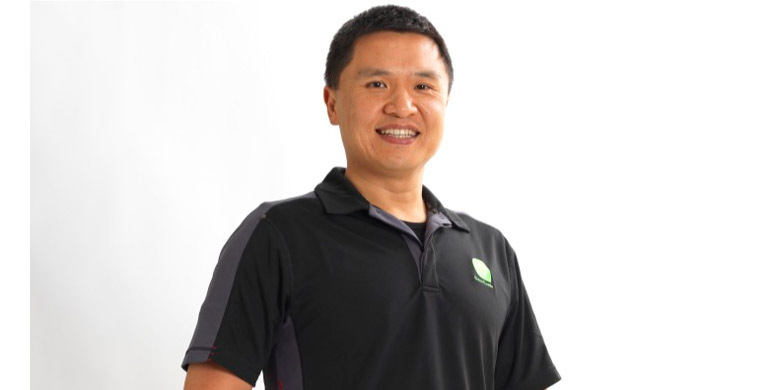 “Profits were important, but cash flow is what kept our company alive,” Huang explained. This decision and the decision to keep things lean kept them afloat. “I try to do everything myself because I want to be in that frame of mind to do everything to make it work because a startup is so hard,” he said. So hard, there was even a time he had drafted a letter to lay-off his staff because there wasn’t enough money to pay them. Luckily, sales from Black Friday put Guitar Hero on the map. Though the game, in its 4th version, went on to bring in $1.5 billion in sales, Huang said he continued to operate just like he did when they had no money. It was an interesting time where he was faced to ask himself important questions. “We were forced to ask ourselves, should we be in this online game rental business. We quickly realized, no. We are never going to get funding, and a business can’t grow. So the next question, what business should we be in,” he said. Switching his focus from the game rental model he started to creating gaming software took RedOctane from $3 million to $9 million in revenue. Huang did receive one other piece of advice. “Our number one rule to surviving those years, somebody told me, just don’t go out of business. Don’t die. As long as you don’t go out of business, smart people will find a way to make it happen,” he said. Huang admits he didn’t know that Guitar Hero would take off the way it did, but he knew there was an audience. “It was a game that really sold the fun factor. You couldn’t explain it. You had to touch it and feel it. You hit five notes and it was like, this is really fun,” explained Huang. “We thought we were selling this aspiration of you being a rock star,” he said. Guitar Hero was acquired by Activision Publishing, Inc.